Marjorie Baer…Sculptural. Elegant. Bold & Distinctive. Annieglass...Complete line of handcrafted sculptural glass dinner and serveware. Cuddle Barn...Animated Musical Gifts for everyone...for every occasion. Nambe...Award winning designs for almost 60 years. Always committed to artistic integrity. 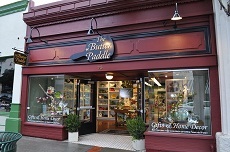 The Butter Paddle buyers search gift shows from coast to coast to ensure the store has an exceptional range of items for every holiday and event. Come in and check out these products new in our store this month. The EMQ Auxiliary and The Butter Paddle want to thank Main Street Burgers in Los Gatos for their generous sponsorship of our "EAT FOR A CAUSE" event on January 15, 2019. Their offer of a percentage of the day's sales generated a donation of nearly $400 for children and families in crisis who are served by Uplift Family Services. Main Street Burgers is widely known for their delicious burgers and beverages, and beyond this well deserved reputation, they also GIVE BACK to the community they serve through events like this. THANK YOU, Main Street Burgers, Los Gatos, for supporting OUR KIDS! Heather says.. I love this place!! Great place for unique gifts and very pleasant and helpful shop owners. My friend was looking for a 22nd Anniversary present for his wife and found the perfect gift. I love the different selection of jewelry they have by very talented artists. If your ever in downtown Los Gatos, be sure to stop by this wonderful shop!! Interested in “hands-on”, community service providing new hope and opportunity for local children and families in crisis? Please consider joining the EMQ Auxiliary. More information is available at the store, on our website at the "Information for Prospective Members" tab, or by contacting EMQ Auxiliary Vice-President/Membership, NANCY MARSH at info@butterpaddle.com.